Another day, another subscription comic book in my mailbox, folded neatly down the middle and wrapped in coarse brown mailing paper. 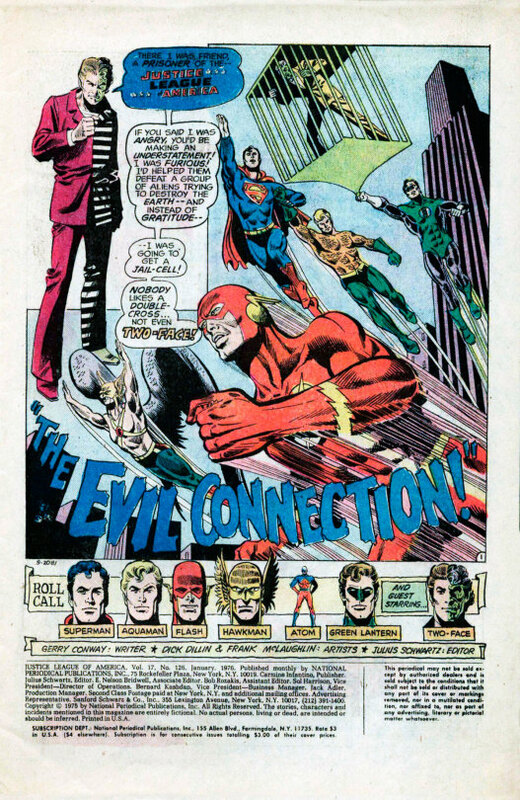 That’s how this issue of JUSTICE LEAGUE OF AMERICA came across the transom, finishing up writer Gerry Conway’s first two-part story on the title he would wind up writing for so many years. The cover is one of the better efforts from artist Ernie Chan/Chua, but his inkwork still looks heavy and inelegant to my eye, and Superman in particular is ridiculously muscle-bound. 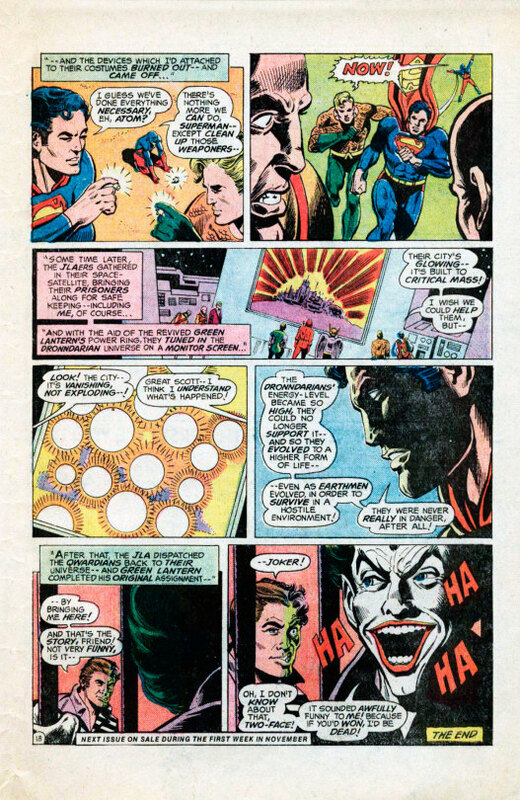 The story opens with Two-Face narrating to an unseen audience his experiences with the JLA. 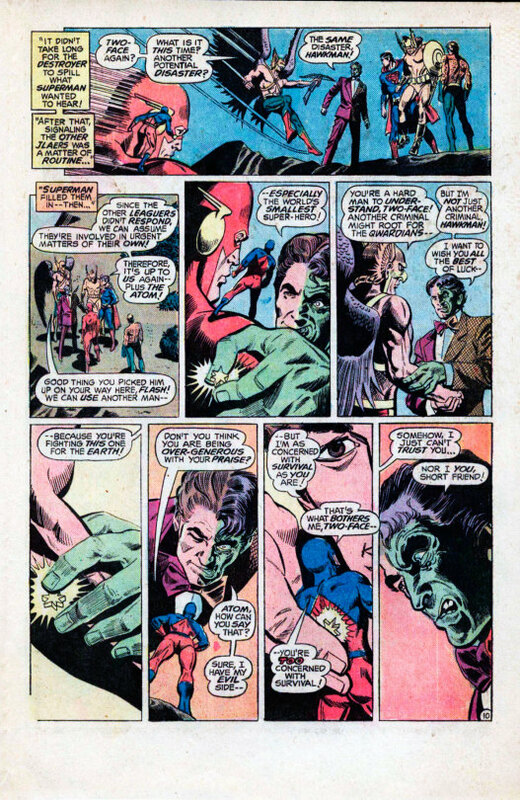 Having seemingly eliminated the threat last issue, the heroes decide to deliver Two-Face back to Arkham Asylum, despite the assistance he gave them. Green Lantern is on his way to do just this when he’s attacked from behind by a lightning bolt-throwing gladiator from Qward! 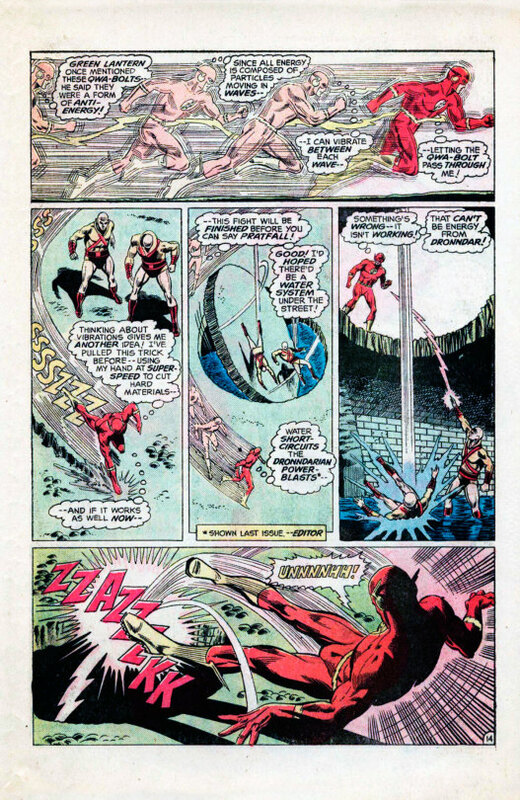 Two-Face has a moment where he could warn GL about the impending attack, but the coin come up scarred, so the Gladiator’s bolt knocks the Emerald Warrior right out of the sky. The Weaponers are attacking three cities simultaneously, using these attacks to syphon the destructive energy from the Dronndarians’ universe into our own. The League typically splits forces, sending heroes to deal with each attack in turn. Hawkman and the Atom head to Toronto, Flash and Two-Face to Bonn, Germany, and Superman, Aquaman and the Atom to Sydney, Australia. In each case, the League handles the invading Weaponers handily–almost too handily. When the Flash is struck down, Two-Face gives him a hand to get back up and punch back at the invaders–a punch that propels its target a city block. Clearly, something strange is going on here. But the Atom’s got it all figured out. (TOLD you he couldn’t help but notice!) 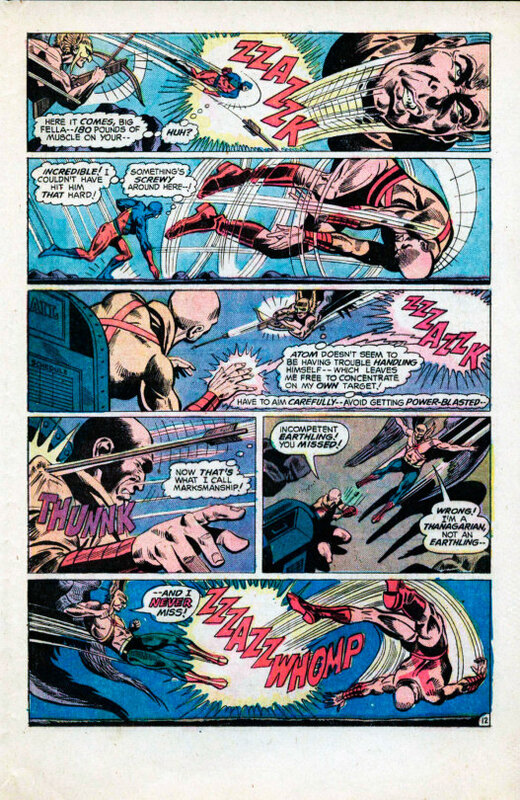 In fighting the Weaponers, it’s the JLA themselves who are drawing the Dronndarians’ deadly energy into our universe. 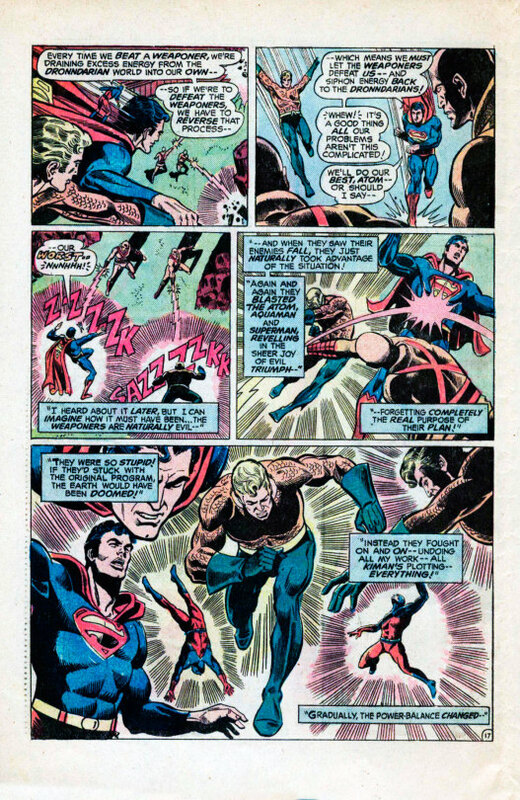 So now Superman, Aquaman and the Atom need to lose, to reverse that process–by taking a beating and not dying in the process. 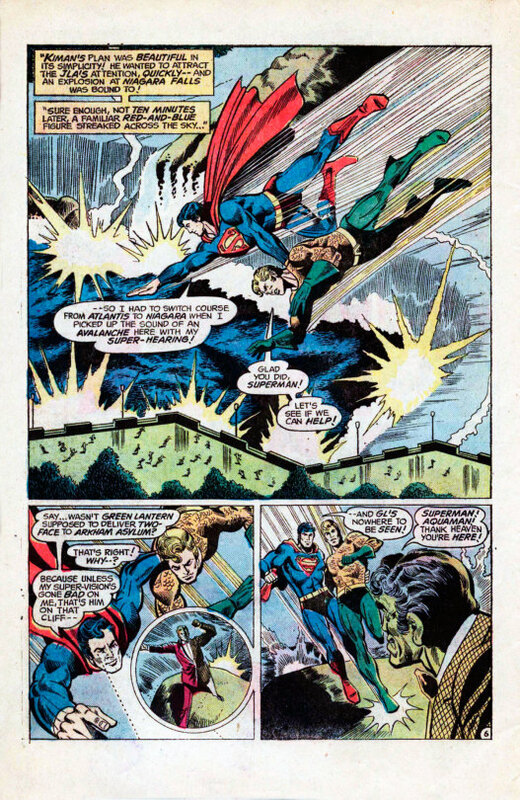 Which, being heroes, they do, in a single-page montage of suffering. Until at last, the star-shaped devices drop off, and the heroes can turn the tables on their attackers. And then, in perhaps the smoothest bit of hand-cleaning there could be, the JLAers tune in on the Dronndarian dimension, to see the built-up destructive energies evolve them into a higher form of life! Turns out they were never in any danger whatsoever, those silly Dronndarians! And the League didn’t just sentence an entire albeit-evil race to genocide! Finally, Two-Face’s audience is revealed as the Joker, who laughs in his fellow criminal’s face. And that’s a wrap!